We went to Mumbai to pick up my friend who had arrived the previous night from her 22-hour trek from Detroit. My husband had an appointment around lunch time so he found us a nearby vegetarian restaurant called Shiv Sagar. Although the restaurant was within walking distance, we had to cross a street to get there and crossing the street in Mumbai is one of the scariest things I have ever had to do. We waited through so many lights while hordes of Indians crossed the street, dodging stray dogs, cars, rickshaws, scooters, and motorcycles. As more and more Indians laughed at us and crossed the street, we decided it was time to just pray and take our chances. It was a nice day so we sat in the covered outdoor seating area instead of inside in the air conditioned dining room. By sitting in this section we saved a few Rupees off our bill. However, when we left our waiter a tip, we used up all of that savings and then some by giving our waiter a ridiculously large tip. We were dining out without our Indian companions for the first time and had never tipped before. Not wanting to give Americans a bad name or make Americans look cheap, we gave what would have been a generous tip in America - probably a few hundred Rupees more than standard Indian tip. I started to think something was up when our waiter called all the other waiters over to look at our bill after we paid it. Only after talking to my husband later did we find out why the waitstaff was all so shocked. If you've eaten at an Indian restaurant in a Western country like the United States, you may be familiar with the crispy papad or papadum bread they sometimes serve as an appetizer. 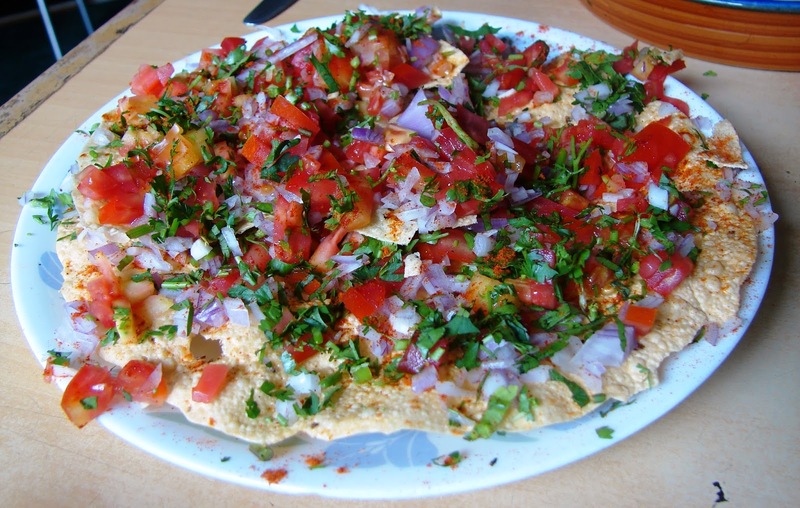 This is that same bread, which is typically made from lentil flour, but with fresh tomatoes, onions, cilantro and masala (spice mix) added on top. I fell in love with this dish in India. It was delicious. However, I do not recommend eating any uncooked food in India if you are a Westerner. You will get sick. At the time, we did not realize that we were ordering uncooked food (tomatoes, onions). You can see how big this is compared to my body in the background. 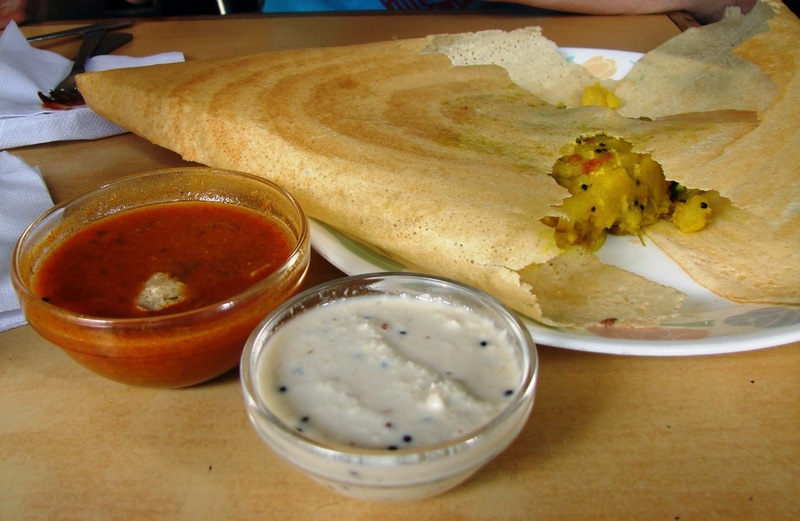 Dosa is a fermented crepe-like specialty from Southern India usually made from rice and lentils. The masala part is hidden on the inside. In this case, masala means spiced potatoes that you eat by wrapping little pieces of the dosa around them. This was my friend's first masala dosa and she thoroughly enjoyed it, as did I. Note that this dish is sometimes made with dairy (possibly ghee or yogurt) so you have to check with the waitstaff when dining out. Usually if it is made with ghee, it is no problem at all to omit it at your request. Do you notice the Marathi Dictionary & Phrasebook in my hand? Marathi is the language of the state of Maharashtra, of which Mumbai is the capital. If you are traveling around India, be aware that not everyone speaks English or even Hindi. You may sometimes be in a position in which you need to know some of the local language and there are many regional languages in India. Before you plan a trip, do some research into where you are going. Throughout my travels in India, I have wanted to communicate with people who spoke only one language, and it wasn't mine. I remember trying to talk to my husband's aunt's servants. One spoke only Hindi and one spoke only Marathi. They could barely even communicate with each other and I, not knowing this, was apparently trying Hindi with the Marathi speaker and Marathi with the Hindi speaker. My husband's family's maid spoke yet another language altogether, but knew some Hindi and Marathi and became really good at understanding my combination of sign language, Hindi, Marathi and English. In this picture you can see the masala inside the dosa. You can also see the tomato and coconut chutneys they give you with the Masala Dosa. The tomato chutney is like a spicy slightly sour (like tomato) tomato sauce. I am crazy about tomato chutney. It was very good here. The coconut chutney is usually less spicy and is like a lightly spiced creamy coconut sauce. Coconut chutney sometimes contains dairy so ask when you are eating out. Eating vegetarian is very easy in India, but eating vegan is not always easy. Dairy is used in many, many dishes in India. Usually South Indian food and Indian Chinese are more likely to be vegan. After having been in India for a while already, my mom was sick of spicy food and jumped at the chance to order pasta from the menu. Imagine her surprise when the pasta was super spicy and our Masala Dosas were not. She will forever remember (and possibly regret) ordering that pasta. Since most people in India eat with their hands, it is customary for restaurants to offer a finger bowl for patrons to use to clean their hands after a meal. You may even be offered a finger bowl after a meal when you are a guest in someone's home. The finger bowl typically consists of a piece of lemon or lime (the two are used interchangeably in India) in warm water. It is very common to have a mouth freshener after a meal in India, typically made from fennel seeds, sugar, and sometimes other additions. This mix serves two purposes; it freshens your mouth while also aiding digestion. Dining at Shiv Sagar was one of those experiences that I will never forget. The food was delicious. We learned some new things and we definitely had some laughs. I would love to come back here some day. Great tips, super interesting! I think it would be so hard for me to even remember to not eat any fresh food in the beginning or to not get anything with ice cubes, ahh! Does it wear off eventually if you're in India for awhile? You can eat fresh food only if it's something like a banana or pomegranate that you can peal the skin off of. They usually don't give ice in India, so remembering not to have ice is not a problem. It wasn't really hard to remember for the most part. It was always in the front of my mind. I guess since I hadn't had masala papad before I didn't realize that part of it was raw and then I wasn't thinking about it when they gave it to us. I feel like it's not really a common mistake because all the doctors warn you before you travel to India. I've tried some Indian food during my time in Malaysia...but it didn't work well with my stomach. I'd love to visit Mumbai one day though! 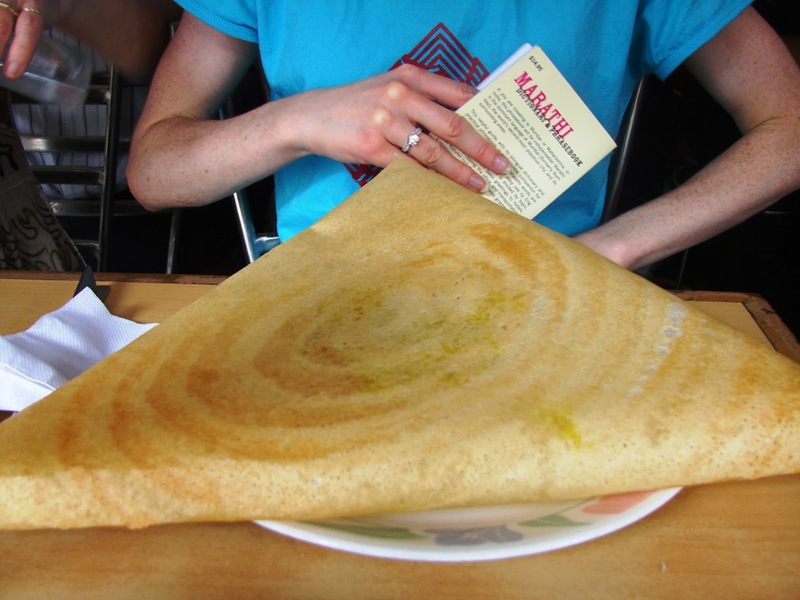 Whoa, that masala papad looks extraordinary including that massive masala dosa…I’ve never seen anything huge like this before…holy craps! Oh no! No Indian food!? That is horrible! Mumbai is super cool. You have to check it out. what a great post. I LOVE eating out in India, especially south Indian food. The last couple times I've gone, I've been in Pune - where Marathi is also spoken, and South Indian food is easily found. I am 100% devout fresh food avoider, even though it can be so alluring. So far my paranoid aversion has served me well though, so I'll stick with it. Also, three cheers for finger bowls. They are so awesome. My husband is from Pune! We mostly stay there when we are in India. What brings you to Pune? I do love the easy access to South Indian food in Pune because I love South Indian food too!